Progress Update: I will be adding a video review in the next 4-8 hours. With smartphones replacing most of the daily functions of a desktop computer, Amazon is looking to do the same with speakers. 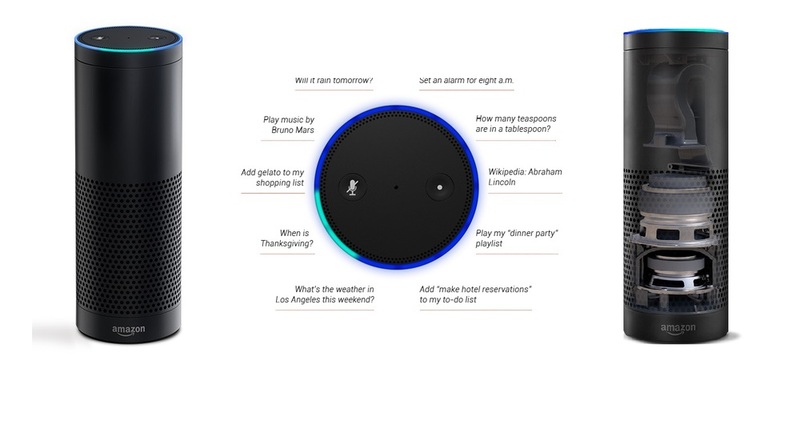 With wearables like Android watches and upcoming Apple Watch gaining interest right now, the Amazon Echo (currently by invitation only) interested me as a stand-alone speaker with bluetooth and Amazon Prime streaming functions. Picked up my voice from 2 rooms away, I could literally shout at it across the house, and it would recognize my voice. Instead of having to pull out my phone, I had the convenience of just saying “Alexa: play relaxation music"
Having nice sounding speakers, instead of playing music from my iPhone. Not getting distracted by my iPhone while changing songs. The added voice features, this differentiates it from all the bluetooth speakers out there. Being able to start music without powering on a speaker system or pulling out your smart phone. All voice activated. Being able to add to your wishlist on amazon, not on the echo app only. Not room filling like a Bose speaker, but gets the job done. Can't compete with OK google in terms of questions. Cooking and eating: music when your hands are full, like cleaning or whipping something up in the kitchen. Also check out the user reviews on CNET and The Verge for more.